Life cycle: This insect produces two to six generations each year. The adult moths hibernate in cabbage debris. Physical Description: This 1/5 inch long caterpillar is a pale green with a black head and tapered body, and can be found hanging from a silk thread. 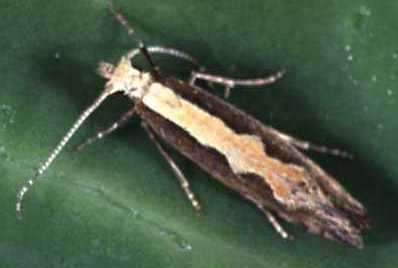 The adult moth is gray with yellow folded wings that have diamond shaped areas. It has a wingspan of 3/4 inches. The yellow eggs are laid on foliage by themselves. Feeding characteristics: This pest attacks broccoli, cabbage, cauliflower, and kohlrabi, by mining the leaves, then feeding externally. 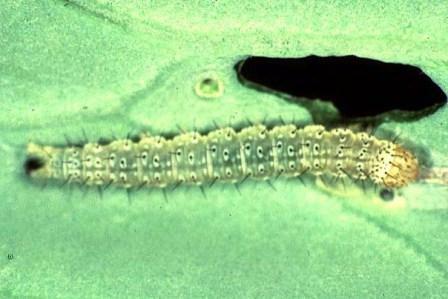 This is a relatively minor pest, but can cause considerable damage to the cabbage family. Controls: handpicking helps for small problems. For larger infestations, use Bacillus thuringiensis and other treatments, such as, the herbal repellant Southernwood.